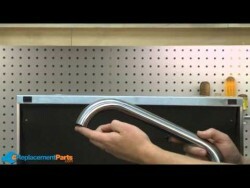 This is a Genuine Manufacturer Approved replacement part used on specific Breville Smart Oven. This part is made out of Metal and is Sold Individually. Dimensions: 14" X 11 1/2"
This is a Genuine Manufacturer Approved replacement part designed for specific Breville Smart Oven. This part is made out of Metal and is Sold Individually. The purpose of Crumb Tray is keep the Oven clean and make cleaning easy and effortless. A genuine Breville replacement part, sold individually. The thermal fuse cuts off power when the oven gets too hot. It's important to note the connections of the wires before replacement. A screwdriver and pliers are needed for repair. Genuine Presto replacement part, this item is sold individually. For use with Presto Heat control, with small probe, used on all current electrical appliances. It has a 29 inch cord. The heat range is from 0-400 degrees. It is compatible with the appliances shown below. This is a Genuine Manufacturer Approved replacement part used on Breville Smart Oven. Spring provides spring action for the Door to keep it shut. This item is made out of Metal and it is Sold Individually.